Wow! The last time I wrote in this blog was in late 2014. I’m looking to get this thing fired up again, so here is a brief update. I last posted in fall 2014 after having done quite a bit of business travel that year, including multiple trips to Austin and a lengthy stay in Albuquerque, among other places. I finally got to “visit” Detroit, albeit just through the airport! I will get to you someday soon, Motor City. In August 2014 I traveled to Edina, Minnesota, also for work. In June, I spent a long weekend with my husband Eric in Rehoboth Beach (Delaware) for leisure purposes. I’d been there a few times before and he agreed with me that the popular little beach town (and its surrounding environs) are well worth the visit. Also in June, we camped in Big Meadows (Shenandoah) with my family. September was our annual family beach trip to Murrells Inlet / Garden City, South Carolina. In October I took a long weekend in a cabin at Shenandoah National Park with Eric at Big Meadows. And of course, that December we traveled home to spend Christmas with family. I took one more business trip to Oakland, California (although I had to stay in Richmond/Berkeley … what a drive) and a great night visit to San Francisco, including the Chinatown area. I’d like to see more of that city. Leisure-wise, in March we took a 10-day Eastern Caribbean cruise that left out of Miami – in the nick of time to avoid a snowstorm – and stopped at St. Kitts & Nevis, Martinique, Dominica (not to be confused with the Dominican Republic), Antigua, and St. Thomas. We also fit in a visit to gorgeous St. John’s as well while we were on St. Thomas, and we did an excursion to the Everglades once in CONUS again. It was one of the most incredible vacations I’ve ever had. It was hard to imagine how anything could top that near-perfect cruise, but our visit to the island of Isla Mujeres, Mexico in August definitely also had us feeling heavenly. The little island charmed us from the start, and I don’t think we ate a bad or bland meal the entire time we were there. The highlight of the trip (and the whole reason I planned it) was swimming with a pod of whale sharks in the middle of the open sea. What an adventure! It more than made up for some mishaps we ran into just trying to get there from DC! This has been a busy year so far and somehow the months have flown by. Day trips have been the name of the game for the most part. I’m really hoping to go camping a time or two this summer, if not several. In July, we have a road trip planned that will last 11 days and show me 5 new states (6 if you count Illinois … I’ve been through both Chicago airports so many jillions of times that I feel strange saying I’ve never been to Illinois at this point! So I usually say I have been there but give a disclaimer). We’re going to start by driving to Chicago, spending a weekend there, then take off on Historic Route 66 (Mother Road dream trip!) and follow that as far as Oklahoma City, then drive to Dallas specifically to stay the night at the Joule hotel and swim in their crazy cantilevered pool. I’m sure we will enjoy lots of other things about Dallas besides that, but ever since I saw that pool I knew I would make a special visit there one day, and here I am. (Never been to Dallas except through the airport several times.) From there we will make our way home with stops in Hot Springs, Arkansas, and Bristol (on the VA side). I have carefully planned everything and picked out certain sites, and at this point, I’m pretty smug about my ability to plan the perfect trip (at least for Eric and I). A road trip of this length and variation is a new one for my planning skills, though, so this is going to be a test to see how I did. I have picked out the sites we both will want to see and planned driving and rest times carefully so I think I am doing good. And, at least I’ve gotten all the hotel booking out of the way! Although this is largely “my” trip, Eric is definitely excited (especially when I told him about some of the very Eric-y things he can expect to visit along the way). At some time in the future, we’ll come back out and drive the rest of Route 66, at least from OKC to LA. We’ll of course also have family trips this year to the beach, likely to Corpus Christi, and possibly Puerto Rico. 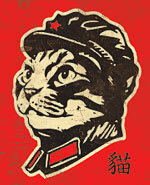 And maybe we’ll have a good weekend jaunt or two. I really want to tick off the rest of my unseen states, so cruises to Alaska and Hawaii and random trips in 2017-18 are very strong possibilities! Our next big international trip is supposed to be Rapa Nui (Easter Island), Chile via Santiago. That one will be another dream come true. Where you have been lately? Where would you like to go? I had this crazy idea of trying to make a list of every overnight trip I’ve ever been on in my life. Then I realized that would take quite some doing. I’d have to leaf back through old journals and photos and interview all my family members to get the full details of every place I’ve ever been. So instead, I’m just going to track where I’ve been over roughly the past year, for overnight trips only, and not counting weekend visits to see friends or family who live close by or nights spent crashing at somebody’s home, starting with June 2013. Lots of fun times (and not so fun times, but that’s part of the package called LIFE). Where will the next year take me? Who knows! I’ll probably be traveling a lot less though. October: Aiken, South Carolina (via Columbia); maybe one other place but I don’t remember what it was and I can’t figure it out! March: I don’t think I went anywhere significant! August: Nothing planned though I’m tempted to plan a last minute trip to Chincoteague or something! I do have four unused vacation days! Whether you’re lounging at home, making day trips or dreaming up your next big vacation, may all your summer days be fabulous in one way or another! We frequent flyers (or flyers, period) who are window-seat lovers can all agree: There’s nothing like the view of the world from up high. How lucky we are to live in an age when a plane ticket is all that separates us from a bird’s eye view. -The sun setting on one side of the sky, while the other side is already dark and studded with stars. How beautiful to see the night rushing in. -New York City – especially the Statue of Liberty! -My own apartment building. I fly past it routinely! -The landing gear coming down from under the wing as we approach our destination. I have been fortunate enough to sit right behind this area on past flights and for me, it’s quite an interesting thing to watch. -I’m sure there are plenty more I could mention, but my personal favorite … one of which I’ll never tire … is the gorgeous sight of the monuments of the metro DC area. Whether lit up at night or gleaming in full sunlight, seeing that beautiful white marble welcoming me home never, ever gets old. At times I feel like we are so close that I could reach out from my window and touch the Washington Monument, the Capitol, the top of the Pentagon. The gasps of pleasure and delight from first-time visitors to our area as they spy these sights are lots of fun too. City life can contribute to grumpy attitudes for many of us, so it’s refreshing to hear someone greeting DC with anticipation! And the icing on the cake, for me, on a return flight into my home airport is seeing the water of the Potomac so close underneath us that it’s almost a little bit frightening! 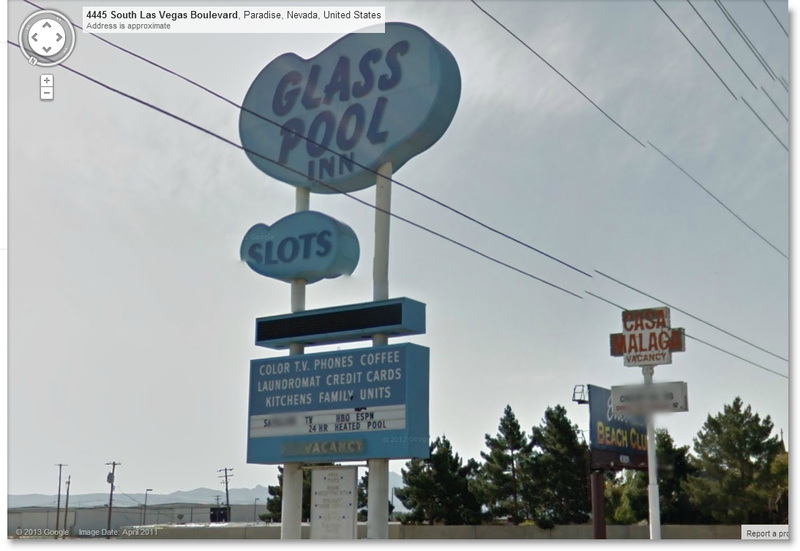 One of the many wonderful old pieces of Las Vegas was the Glass Pool Inn, a relic from a very different time on the Strip. It stood across Las Vegas Boulevard on the Southern end. (If you hiked just past Mandalay Bay you’d find it soon after on the opposite side of the road.) Built in or before 1952 as the Mirage Motel, the Inn changed names in 1988 after selling the name to Steve Wynn, who, as you might have guessed, applied it to his glamorous, gleaming, sprawling new resort. The new Mirage was a sign of things to come – an era of new behemoth resorts that would continue to dislodge the roadside motels like the old Mirage. But the little two-story Inn down the street was quite famous in its own right for its lovely above-ground pool, whose round porthole-like windows allowed swimmers a view out onto the road from their aquatic piece of heaven. The new name of Glass Pool Inn was catchy and the new sign, with its aqua blue pool-shapes, looked like it should have been there all along. Although much beloved, the Inn was torn down in 2004 for reasons I can’t quite figure out. I haven’t yet seen where there are any plans to build a new resort or casino at the site. I’m sure one will eventually spring up once Vegas makes a full comeback from the economic downturn that left incomplete and abandoned resort/casino projects in a few places on the Strip. In 2012, the motel’s sign was cut down with the intention that it would be put up in the Neon Sign Museum on Fremont Street (downtown Vegas). But then the sign vanished from the (locked, gated) lot. To date no one has any clue what happened to it, but the fear is that it was sold for scrap metal. 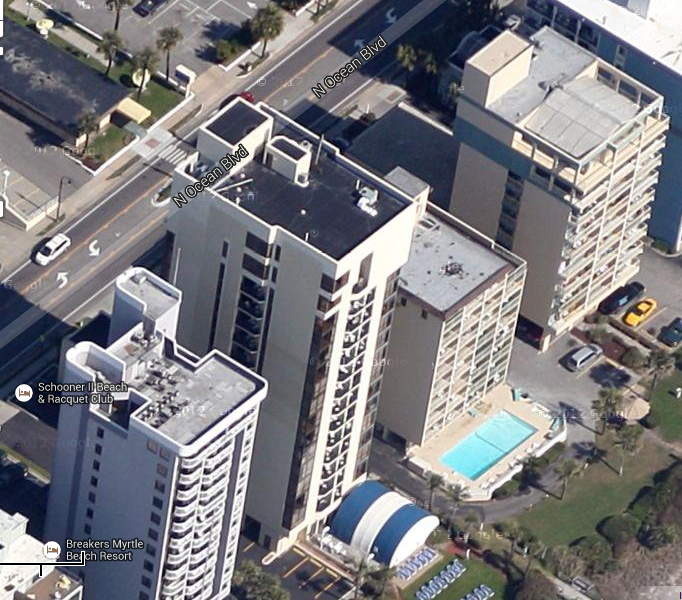 Like so many things, the Glass Pool Inn lives on in Google Maps! One of the things that’s a little hard for me about loving a place is watching it change. I’ve never been one of those people who is able to view inevitable change with a detached sense of shoulder-shrugging acceptance. Of course we know time in its petty little pace never slows for anyone. We all age, and the places we love age along with us. Still, I couldn’t help feeling somewhat sad when I recently began a drive down Myrtle Beach’s famed North Ocean Boulevard. Husband in tow, I found the place looked so far removed from what it once was that I had a hard time making sure I was leading him in the right direction. This was not altogether surprising. I’d last seen it in 2000, on spring break from my freshman year at Virginia Tech. I knew the Myrtle Beach Pavilion amusement park and the teen club The Attic were both gone, as was the Myrtle Square Mall with its giant neon ceiling clock and ocean-themed food court. But my ultimate goal on this drive anyway was to view the Cadillac Court, the three-building hotel where my family had stayed decades before. As we got oriented on Ocean Boulevard and began looking for parking, I saw that the Pavilion’s spot is now a huge grassy field with zero sign of what it once was. I was really taken aback by how completely empty it was. I was sure someone would’ve taken advantage of this prime piece of real estate in some way since the Pavilion’s closing in 2006. Nothing of the once landmark park remains, except for what looks like an old staircase to one of the rides, looking out of place by itself on the far side of the lot from N. Ocean. There was a time when it seemed the Pavilion was destined to last forever. The Boulevard was missing some other old favorites. There was no longer a Candy Castle, a giant globe or a larger-than-life jukebox. Some of the little mom-and-pop hotels and motels also seemed to be missing or were boarded-up and abandoned, having lost the battle against fancier resorts with elaborate mini-water park setups. But there were new points of interest taking the place of these old friends – a beach boardwalk, landscaped pocket parks, gleaming new stores and restaurants, a pedestrian skywalk, a cool painted mural of an insect band playing to a captive forest audience – complete with poem!, the towering SkyWheel, and miniature amusement parks. (“A pale imitation of the Pavilion,” I sniffed haughtily as we passed one.) Nestled between some of these things was the Gay Dolphin Arcade and souvenir shop, no longer offering rides to the top of the glass tower but still boasting the iconic old sign. “I really wasn’t joking,” Eric said matter-of-factly. “That was it back there.” That big empty lot full of dirt – that was my Cadillac Court. Is “devastated” too dramatic for my feelings? At that moment, it didn’t feel like it. I was melancholy all the way back to the Gay Dolphin, where we played enough arcade games to win a few prizes. I pouted like I had never aged past those Myrtle Beach summers and let Eric help me nurse my gloom with by-the-slice boardwalk pizza and walk-up-window ice cream cones. Later, I did a little research and read that the Cadillac Court had recently been converted into lower-cost apartments called Beach View. 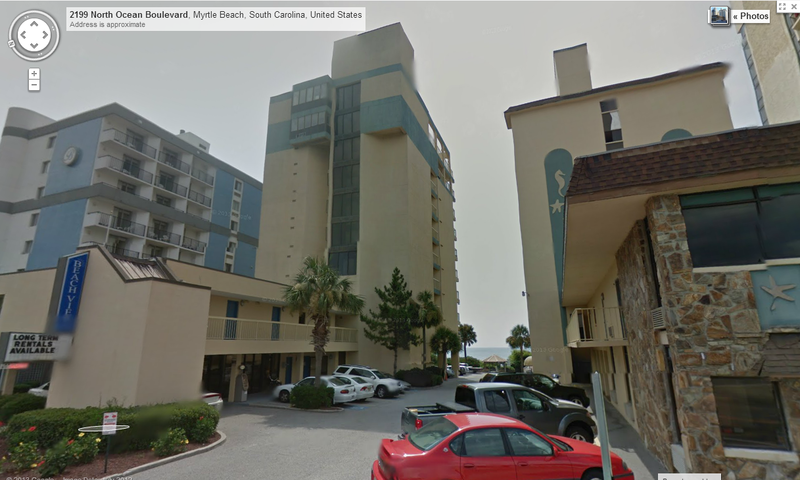 Earlier that summer, the residents had received a month’s notice that their building was being knocked down and replaced with a new Hilton timeshare resort. The Schooner II staff has been posting a stream of photos on their Facebook page documenting the demolition process. Nothing lasts forever, but sometimes I can’t help but feel there are some things that should. Such is the way of the world. Cadillac Court is gone, but my memories make it feel as timeless as if it were still standing, just waiting for me to come look out from a yellow-railed balcony at a sun shining as though it was never meant to set. One place this building still lives is on Google Maps. This street view shows the hotel exactly as I remember it from younger days. Fantastic satellite view – the two towers are unlabeled here (the last two on the right). Today the outdoor pool shown here is filled in with dirt. You can see the stainless steel pool area on the top of the far right tower – see the cover? Check out a few old Pavilion rides (mostly kiddie rides) at the Pavilion Nostalgia Park at Broadway at the Beach, Myrtle Beach.